Southern sea otters (Enhydra lutris nereis) are not considered prey for white sharks (Carcharodon carcharias), but in California, sea otter carcasses have been increasingly observed with shark bite wounds over the past decade. USGS and California Department of Fish and Wildlife (CDFW) researchers have published the data behind this trend in the journal Marine Mammal Science. Researchers examined 1,870 carcasses collected over 29 years in California shorelines and waters via the Southern Sea Otter Stranding Network led by USGS, CDFW, Monterey Bay Aquarium, and The Marine Mammal Center. Within the past 10 years, sea otter strandings with shark bites have increased exponentially—shark bites now account for more than half of all southern sea otter carcasses recovered in California. The Estero Bay and Pismo Beach regions have seen the greatest increase, followed by the northern Monterey Bay. 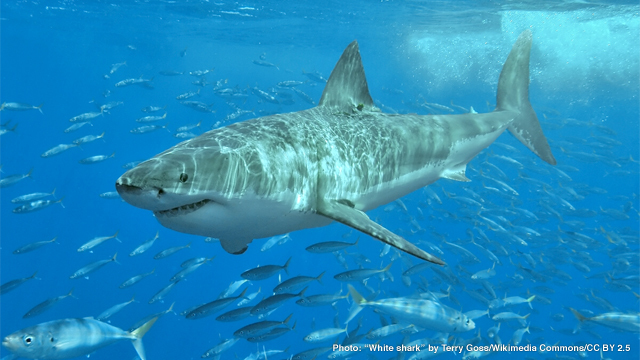 This marked change may be due to growing white shark populations or spatial shifts. Laws protecting white sharks may have led to their greater numbers in the northeast Pacific, although data on white shark abundance and trends are limited. White sharks might also be spending more time feeding inshore, due to a boom in marine mammal populations, such as northern elephant seals (Mirounga angustirostris) at Piedras Blancas and Año Nuevo. An increase in shark bitten sea otters in winter and early spring may coincide with movements of sharks between feeding areas, particularly sub-adult sharks that are transitioning from a fish diet to a marine mammal diet. Shark-bite evidence continues to point to white sharks alone, and not other shark species. Perplexingly, there remains no evidence that white sharks ever actually consume the sea otters they have bitten. Possible explanations for non-consumptive biting of sea otters by sharks include mistaken identity or investigatory bites, as well as lack of high caloric blubber or palatability of sea otters. This is the first-known case where white shark bites have come to represent a major source of mortality for a non-prey species. Research suggests sea otters are approaching carrying capacity throughout the center portion of their California range. Sea otter range expansion and growth at the northern and southern ends of the range will be critical for continued recovery—yet these are the very areas where the increase in shark-related mortality has been greatest. The explanation for these investigative bites and the cause of this exponentially increasing trend remain unclear, due to lack of data on white shark life history, population trends, and movements. Shark-bite frequency and location data from the sea otter stranding survey may provide a useful proxy for studies of white shark activity in relation to human coastal use. Although southern sea otters (Enhydra lutris nereis) are not considered prey for white sharks (Carcharodon carcharias), sharks do nonetheless bite sea otters. We analyzed spatial and temporal trends in shark bites on sea otters in California, assessing the frequency of shark bite wounds in 1,870 carcasses collected since 1985. The proportion of stranded sea otters having shark bites has increased sharply since 2003, and white shark bites now account for >50% of recovered carcasses. The trend was most pronounced in the southern part of the range, from Estero Bay to Point Conception, where shark bite frequency has increased eightfold. Seasonal trends were also evident: most shark-bitten carcasses are recovered in late summer and fall; however, the period of elevated shark bite frequency has lengthened. The causes of these trends are unclear, but possible contributing factors include increased white shark abundance and/or changes in white shark behavior and distribution. In particular, the spatiotemporal patterns of shark-bitten sea otters match increases in pinniped populations, and the increased availability of marine mammal prey for white sharks may have led to more sharks spending more time in nearshore waters utilized by both sea otters and pinnipeds.